Stroud Short Stories is back on Sunday, 14th October, 2012 and is looking for stories to be read by their authors at this event. 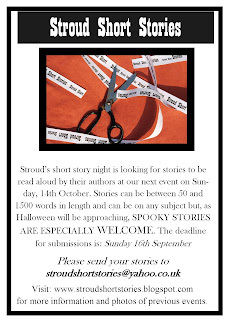 Stories can be between 50 and 1500 words in length and can be on any subject but, as Halloween will be approaching, SPOOKY STORIES ARE ESPECIALLY WELCOME. The deadline for submissions is: Sunday 16th September. Authors are welcome to submit up to three short stories.